Birthplace : Tampa, Florida, U.S.
Ottis Dewey Whitman Jr., known professionally as Slim Whitman, is an American country music singer and songwriter, known for his yodeling abilities . Though he was once known as "America's Favorite Folksinger," Slim Whitman was, for the majority of his career, more famous in Europe than in the United States. Best remembered for his early-'50s hit singles like "Love Song of the Waterfall," "Indian Love Call," and "Singing Hills," Whitman was an excellent yodeler known for singing mellow, romantic, and clean-cut songs. As a child, Slim Whitman became infatuated with music and learned to yodel listening to Montana Slim and Jimmie Rodgers records. At age 17, he married 15-year-old Geraldine Crist, a preacher's daughter. The newlyweds moved to a 40-acre farm south of Jacksonville, FL, where Whitman worked as a meat packer. While working in the plant, he suffered an accident and lost two fingers on his left hand. After the accident, he began working in a Tampa shipyard. During World War II, Whitman served in the U.S. Navy, where he learned to play guitar. Following the war, he returned to the shipyard and also joined a local minor-league baseball team, the Plant City Berries. Whitman remained with the team through 1948, but then began building a singing career at several Tampa radio stations, eventually creating a backup band, the Variety Rhythm Boys. Slim Whitman got his first big break after Colonel Tom Parker -- who was managing Eddy Arnold at the time -- heard him singing on radio station WFLA. Parker landed a contract with RCA for Whitman by the end of 1948. After reluctantly complying with the label's request to change his first name to "Slim," he released his first single, "I'm Casting My Lasso Towards the Sky" -- eventually to become his theme song. He made his national debut on the Mutual Network's Smokey Mountain Hayride in the summer of 1949, and the following year joined the Louisiana Hayride. Despite his national exposure, Whitman's career wasn't making much of an impact, and he was forced to take a job as a part-time mailman. In the early '50s, he released a cover of Bob Nolan's "Love Song of the Waterfall," which became his breakthrough hit, peaking at number ten on the country charts; the follow-up single, "Indian Love Call," made him a star, peaking at number two on the country charts and crossing over into the pop Top Ten. Both sides of his next single -- "Keep It a Secret" / "My Heart Is Broken in Three" -- were also major hits and he continued to have a string of Top Ten hits into the mid-'50s. In 1955, his title song for the film Rose-Marie became a smash on both sides of the Atlantic; following its success, Whitman joined the Grand Ole Opry, and then went to Britain in 1956 as the first country singer to play the London Palladium. Throughout the late '50s and early '60s, he had a string of British hits, including "Tumbling Tumbleweeds," "Unchain My Heart," and "I'll Take You Home Again Kathleen." Although he was experiencing great success in the U.K., Whitman's career was in neutral in the U.S. After 1954's "Singing Hills," he had only two Top 40 hits in the course of a decade. In 1965, he bounced back into the country Top Ten with "More Than Yesterday." For the next few years, he had a series of minor country hits, including "Rainbows Are Back in Style" (1968), "Happy Street" (1968), and "Tomorrow Never Comes" (1970). Throughout the early '70s, he continued to have minor hits, but in 1974, he retired from active recording. In 1979, Whitman filmed a television commercial to support Suffolk Marketing's release of a collection of his greatest hits. On the strength of the commercials, All My Best sold four million records and became the best-selling television-marketed album in history. After its success, the label released Just for You in 1980, and The Best in 1982. Between 1980 and 1984, Whitman had a small run of minor hits, highlighted by 1980's number 15 hit, "When." In the late '80s, he returned to television-marketed albums, releasing Slim Whitman: Best Loved Favorites in 1989 and 20 Precious Memories in 1991. During the '90s, Whitman recorded infrequently but continued to tour successfully, particularly in Europe and Australia. 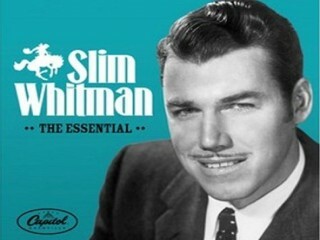 View the full website biography of Slim Whitman.